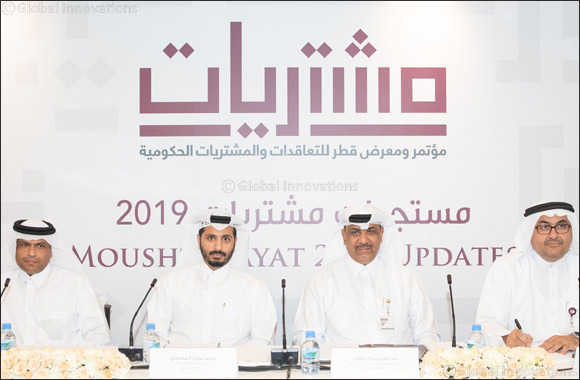 Doha, Qatar, March 18, 2019: Qatar Development Bank (QDB) and the Ministry of Finance hosted a press conference yesterday, on Sunday March 17 at the Ministry to announce the main preparations to welcome the 4th edition of Government Procurement and Contracting Conference & Exhibition ‘MOUSHTARAYAT 2019’. Scheduled to take place for three days between March 31 and April 2, the 4th ‘MOUSHTARAYAT’ will be held in collaboration with the Ministry of Finance, and in partnership with the Ministry of Commerce & Industry (MOCI) and the Public Works Authority (Ashghal), and sponsored by the Ministry of Municipality and Environment. The Government Procurement and Contracting Conference & Exhibition ‘MOUSHTARAYAT,’ invites members of the private sector, particularly small and medium enterprises (SME), to attend and participate in a wide range of public tenders. A key aspect of the conference is to educate the local SMEs about the procedures involved in existing public tenders extended by big buyers, such as larger private sector companies, semi-governmental and governmental bodies. The exhibition will offer 2606 business opportunities approximately rounding up to QR 5.8 bn and will feature 6 workshops, witnessing the participation of 35 exhibitors. Moushtarayat’s primary objective has always been to open a wide window for networking between big buyers and local SMEs to realize the actual opportunities. Additionally, the event intends to facilitate supplier/buyer relationships through exhibition by sharing information. The trade show facilitates SME access to procurement of large buyers through a single platform to access all government tenders and builds a database such as suppliers profiles, buyers tenders, etc. The upcoming event also aims at educating attendees on the procedures involved in partaking in future tender and application processes successfully, so that members of the private sector can become active contributors towards the diversification of the economy. The 3rd edition of Moushtarayat fetched close to 2000 business opportunities, which were worth QAR 6.5bn in terms of value, hosting around 40 exhibitors. The value of concluded contracts was to the tune of QAR 1.2bn with close to 3140 visitors attending the show. The past three editions hosted 107 B2B Matchmaking meetings, 10 workshops and 5 awards. MOUSHTARAYAT 4 will create a platform to boost small businesses through changes in procurement and outsourcing rules and regulations to reduce burdens on SMEs, which is in line with Qatar National Vision 2030.